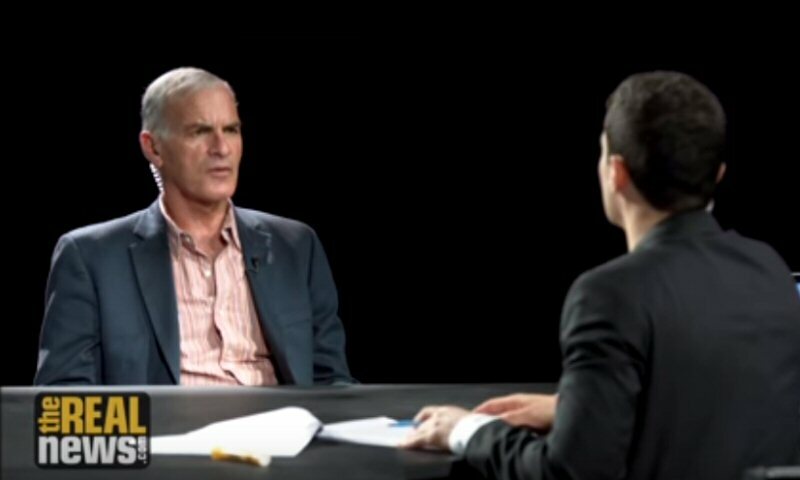 In the second part of this three-part interview special, author and scholar Norman Finkelstein analyzes the material, emotional and psychological factors behind the American Jewish embrace of Israel after the June 1967 war. Aaron Mate: It’s The Real News. I’m Aaron Mate. We’re continuing our discussion with the author and scholar, Norman Finkelstein, about the 50th Anniversary of 1967 War. Norman, let’s get to the American context, in the American-Jewish context. A key argument that you made in your work is that Israel did not factor very much into American-Jewish life until ’67, which I think would surprise many people. What changed then? What happened? Why did Israel, all of a sudden, become an important issue for American Jews? Norman F.: Well, there’s a Hungarian philosopher, a Marxist philosopher. He’s, of course, passed the scene a long time ago. His name was Lukács. He once commented that it’s important, always, to see the present as history, to see the present in a historical context. That remark always resonated with me when I was studying the history of the Israel Palestine conflict and also, writing to some extent, not largely, on the Nazi Holocaust and it’s reception in the United States. The fact of the matter is, we all figured very marginally the American-Jewish life up until 1967. I, for example, at one point, went through the main Jewish periodicals during the period from Israel’s founding until 1967. There’s barely anything on Israel if you take the main socialist Jewish periodical that was really Jewish but socialist with Jewish editors, Dissent Magazine. People like Irving Howe who are very prominent American-Jewish intellectuals later became phonetically pro-Israel. Dissent was founded in ’54. Between ’54 and ’67, there are only three articles on Israel and Dissent. Of those three, one of them condemned Israel for the 1956 invasion of Egypt, the Sinai attack. You take the most mainstream Jewish periodical. The establishment periodical was Commentary Magazine. There was a famous joke by Woody Allen, “What do you get if you combine Dissent with Commentary? You get Dissentary”. You have to be from that era to appreciate. Commentaries edited by this person named Norman Podhoretz beginning in 1960, Podhoretz comes to the helm of commentary. Podhoretz also became a phonetical pro-Israel supporter after ’67. Now, he’s editor in chief of Commentary in 1960. It’s very interesting. I read through all the issues from ’60 to ’67. There’s barely any mention of Israel. Once in a while, you would have an article like “My son had a bar mitzvah in Israel”. It’s human interest stories, but very little having to do with the politics of Israel. Aaron Mate: There was a connection, though, during this time between the American-Jewish left in Israel. It’s personified by Noam Chomsky who went and lived there with his wife, right? Norman F.: Yeah. Well, Professor Chomsky, back then, was not a known leftist. He only came to prominence in the early 60s with the Vietnam war. Aaron Mate: Those were the socialists. In [record 03:44], those were still socialists. Norman F.: Yeah. People won the leftist and the spectrum and that brings us to the point of why the people in the leftist and in the spectrum were not afraid of the dual loyalty charge because they did have a second loyalty to the Soviet Union. That was part of their political being. The idea of a dual loyalty did not scare the American-Jewish left because they already had a dual loyalty, but those who wanted to be in the mainstream of American life, which the communist party obviously wasn’t, the biggest fear that Jews have always had is this charge of a dual loyalty, that they’re not really loyal to their state where they have citizenship, they are loyal to this entity named the International Jews, this conspiracy of International Jews. There was always, among Jews, the fear of being tagged as having a dual loyalty to your state but also, to International Jury. Come Israel’s founding in 1948, there’s a real problem now because there’s an institutional basis for the claim of dual loyalty. Israel claims to be the state of the Jews. American Jews now have a big burden. The burden is, here is a state that’s saying that we claim your loyalty and you should be loyal to us. This is after World War II where, for reasons, which haven’t been clearly analyzed yet, suddenly, all the doors are opening up to Jews. It was a period of incredible upward mobility among American Jury. As this upward mobility suddenly seems a real prospect, the very last thing American Jews want is to be tagged as having a dual loyalty to Israel. They’re keeping Israel at arm’s length because (1) they don’t want the charge of dual loyalty, in general, but (2) is because they’re now on the verge of making it in American society. Aaron Mate: What changes then with the ’67 war? Norman F.: Well, the main thing that changes is that, now, Israel becomes integrated with U.S. power, the U.S. starts calling Israel its strategic asset because Israel had proved itself a first class fighting force in the ’67 war. Aaron Mate: Struck a blow to Arab nationalism by taking Nasser. Aaron Mate: Also being beaten by a third world country. Yeah. Norman F.: Right, also being beaten by these third world, anti-imperialist, so on and so forth. Now, Israel appears to be beating back the third world anti-imperialist hoards in the Middle East. They’re winning wars, while the U.S. is losing a war. In fact, at that time, it was said, “What we need to do, meaning the United States, we have to bring Moshe Dayan to Vietnam”. Yeah, that’s what was said at that time. “He will show us how to win the war.” He did go in 1966, my memory is, but I could be wrong. My memory says ’66 but I could be mistaken. In any case, now, the tables had turned whereas, before if you are pro-Israel, it resurrected the charge of dual loyalty. Now, if you are pro-Israel, you are super loyal to the United States because Israel was defending our interest in the Middle East and it was winning. Now, it was safe to be pro-Israel because Israel was our strategic asset. Aaron Mate: Not just safe but advantageous. I want to quote you something but you’re right. You’re talking about Neocon Zionist and you’re right. This gung-ho Zionist did not even subscribe to the Zionist tenant that Jews had no future in gentile world. On the contrary, they converted to Zionism because it facilitated their acceptance in the United States. Norman F.: Yes. Because now, if you are pro-Israel, you are a hero in the United States because Israel was defending our interest in winning. It was a cache to be pro-Israel after ’67. There were also … It’s fringe benefits. One of the fringe benefits, which is completely forgotten now because culture has changed so radically, the image of Jews back then, Jews were nebbishy, if you can translate that from the English. Norman F.: Yeah. Jews were nerdy, Jews were schlemiels. Well, that’s what we were described as back then. Jews were weaklings. That’s the overall cultural stereotype, the Woody Allen type, the scrawny Jew with a horn-rimmed glasses. Super added to that was the image of Jews from the Nazi Holocaust. Aaron Mate: The sheep to the slaughter. Norman F.: Yeah. It’s so funny to say now because people will just look at me like I’m dropped from another planet. Back then, it was a very big embarrassment to be a survivor of the Nazi Holocaust. My parents, as you know, were both the Nazi Holocaust. My father was an Auschwitz and my mother was Majdanek. Every member of their families exterminated on both sides. My mother always use to get very angry when people ask her the question, “How did you survive?” Now, you think that’s an innocent question. In fact, most of the time, I think it was meant innocently, but there was always the subtle dig or my mother perceived it as such that the only way you could’ve survived is if you did something dirty. Norman F.: We have to have done something, otherwise, “How did you survive?” I remember, sometimes people would ask their question to my mother innocently and she’s, “What a dirty question”. The other thing was, those who didn’t survive, they went sheep to slaughter. It was a badge of shame to have survived. Israel, I hate the word but I’ll use it now, tried to rework the narrative. They start to call it when it came to Nazi Holocaust and commemorations. They didn’t call it day of remembrance. They called it the day of resistance and remembrance because they conjured this whole mythology that there was massive Jewish resistance to the Nazi Holocaust. Aaron Mate: Well, where they could there was, obviously. Aaron Mate: He was the destruction of the European Jews. Yeah. Aaron Mate: Exactly. Yeah, there couldn’t be. Norman F.: There couldn’t be, but then Zionist wanted to create the image of the Jewish fighter. Well, to fast forward, after ’67, Jews now had a new image. Something totally new and so to speak, Jewish history, the image of the Jewish fighter. American Jews grabbed it. They loved it. They loved it. There was, actually, a quite good book written probably around 30 years ago now by Paul Bryant. He’s a professor. He’s probably passed the scene already. It’s called, “Tough Jews”. He talks about how after ’67, all of a sudden, you start seeing this proliferation of novels by Jews about Jews who are blond-haired and blue-eyed and muscular. It was totally unheard of before. Blond-haired Jews, blue-eyed Jews, muscular Jews. Aaron Mate: I don’t know too many blond-haired Jews. Norman F.: The Jews, American Jury, they really grabbed the idea of the fighter. Aaron Mate: This is really a typical case of the macho dynamic. This inflated artificial sense of toughness and manhood is achieved through projection. That, really, is beating up on defenseless people. The Arabs in ’67, as you’ve documented in part one, it didn’t put up much of a fight. Of course, the Palestinians under occupation that is really as roll over, also, don’t have a military [idea 15:27]. Norman F.: Well, it’s a very strange dynamic. I’m not too fond of psycho history, but there is a kind of psychological dimension to it, which has a lot of relevance even to this audience because that was the era in which real tensions came to the surface between the Jewish and the African-American community. Right at the time of the ’67 war is the 1968 school strike in New York pitting the largely Jewish teachers union headed by Albert Shanker against the African-American community in Ocean Hill-Brownsville. There was, now, a lot of tension between African-Americans and Jews. Even when you read Norman Podhoretz’ memoir, the making it, he talks about how he was always afraid of being beaten up by African-Americans. A lot of this psychodrama being played out in the United States beating up Arabs was a displacement of the tensions with African-Americans in the United States between African-Americans and Jews. It’s a weird dynamics. Aaron Mate: Is that why in the ’80s and ’90s and maybe even 2000s, I would read about people like mainstream Jewish figures complaining about “black anti-Semitism,” as if that was a serious problem? Norman F.: Well, it’s a bit of digression but it’s still, I think, worthy of comment because the history has been so completely rewritten. When we talk about that era, the only people they talk to you about are Schwerner and Goodman, Rabbi Heschel who were killed during the Freedom Summer in the south. Of course, they deserve any kind of recognition they get. There is a “but”. One has to be honest about what it was like in the American-Jewish community back that I grew up in it. I didn’t know a non-Jew up until I entered college. No, that’s literally true. These were very ethnic homogeneous enclaves. Now, my school had non-Jews. Not as in high school. You’d never know it because it was so internally segregated. It was all the honor or what were called, back then, honor and honor bright classes were all Jewish without exception. All right. There were two exceptions. In any event, getting back to the point, the Jewish community was so racist. Now, in retrospect, it’s mind bugling but nobody ever accepted my family, nobody ever referred to black people as Negros, which was the proper term back then. It was always niggers, coloreds, and Schwarzes. That was the Jewish community. Now, it’s all been forgotten. They talked about in Ocean Hill-Brownsville the black anti-Semitism, but what’s completely left out was the Jewish racism, which was so thick in the Jewish community. That was my neighborhood. That’s what it was like. All of the hatred loathing animist towards African-Americans was now after ’67 displaced on Arabs. Very strange phenomenon, nobody has ever commented on it, but you had to have experienced it to see what was happening just as an interesting point after Israel wins in ’67. The Arabs are now humiliated, Six Day War, as it was called, wiped out all the Arab armies. The claim was that the Arabs no longer have what was called, back then, a war option because this is what was said then, “The Arabs don’t know how to fight”. You know what they called the Arabs? Israelis called them the nickname. They were called monkeys. That’s why the ’73 war came as such a shock to Israel because they had internalized all the racism. Arabs can’t fight. They didn’t believe that the Arabs can mount an attack on Israel. It was the racism. Aaron Mate: Okay. Which takes us then to what’s going to be our next part, part three, and we’re going to talk about what changed for the world in ’67 and what had happened in the 50 years since occupation of the West Bank in Gaza. My guest is Norman Finkelstein.